Looking for new ways to entertain a broader range of employees at your corporate retreat? 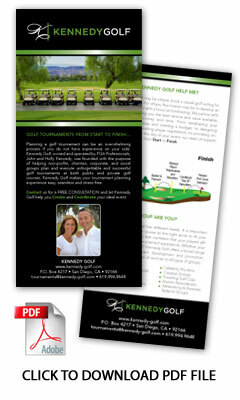 Love the idea of a golf outing but the cost and logistics make it too challenging? 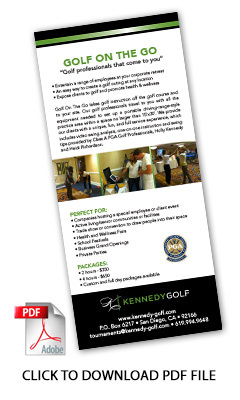 Interested in exposing your clients to golf as a way to promote health and wellness? Golf On The Go provides a fun and cost effective option for you! Golf On The Go takes golf instruction off the golf course and to your site. Our golf professionals travel to you with all the equipment needed to set up a portable driving-range-style practice area to give short golf lessons to multiple guests at your venue. We provide our clients with the opportunity to be a part of a unique, fun, and full-service experience, which includes video swing analysis, one-on-one instruction and swing tips provided by Class A PGA Golf Professionals, Holly Kennedy and Heidi Richardson. How does Golf On The Go work? Golf On The Go can be done outdoors or indoors and requires a space no larger than 10’x20’. We provide complete set up of a practice area, just as you would find on a driving range, including state of the art video equipment, golf clubs, a hitting mat and net, and teaching aids. Each guest receives a 10-15 minute session of one-on-one golf instruction and swing tips, followed by a video swing analysis. Who uses Golf On The Go? Companies sponsoring or participating in a trade show or convention and want to have a unique entertainment feature to capture people’s attention and draw people into their space. Holly, Heidi & John – thank you so much for your service at our annual Employee Health Fair. Our employees absolutely loved the golf swing clinic. We look forward to having you back again next year!